Don't let the mileage fool you! 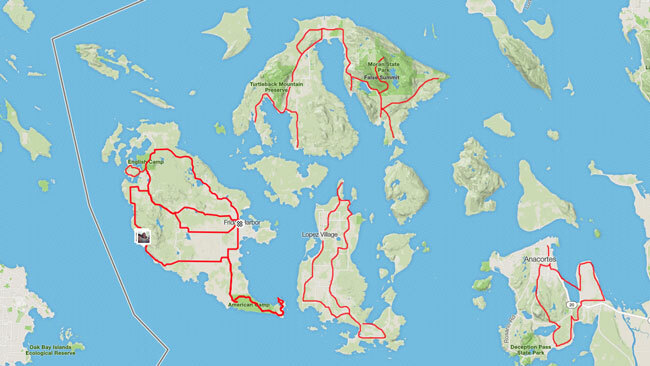 This is a fun and challenging island cycling vacation that hops between islands filled with sweeping vistas and some epic climbs. During the week we will ride the classic three islands of the San Juans - Orcas, Lopez and San Juan Islands plus the neighboring islands Fidalgo and Whidbey. This Washington bike Tour meets in the quaint seaside town of Anacortes on Sunday. If you are flying in, we suggest you fly into Seattle-Tacoma International Airport (Sea-Tac) on Saturday, and then take the shuttle bus to Anacortes either Saturday or early Sunday morning. We meet at the Majestic Inn & Spa in Anacortes on Sunday at 12:00 Noon. After setting up bikes and a brief orientation we will go for a shake down ride around Fidalgo Island, the gateway to the San Juan Islands. After the ride, explore downtown Anacortes before dinner in the elegant dining room of the Majestic Inn. Then perhaps have cocktails on the rooftop balcony. We start Day 2 with an early morning Ferry to Orcas Island, "the Emerald Isle." Our first ride is on the San Juan Islands Scenic Byway as we wind our way around the island to Eastsound harbor, the main island village. From there we will summit Mount Constitution, the highest mountain in the San Juans. It's a steep forest climb to the top, but the views from the 1930's lookout tower are Epic. Panoramic vistas of the Olympic Peninsula islands and mountain ranges of Washington and Canada are your reward. It's all downhill to the Roasario Resort & Spa, our home for the next 3 nights. The resort sits in it's own private harbor and marina with views of East Sound. Today we bike the San Juan Islands Scenic Byway to the far west side of the island, passing through West Sound and Deer Harbor. There are many side roads to explore for those who want extra miles. Heading back, we'll stop in Eastsound village for lunch. Relax for the rest of the afternoon, or head back out to the east side of the island for an Epic Finale up Mount Constitution. Dont let the mileage fool you, those 52 miles reqire close to 5 hours to complete. A short morning Ferry takes us to Lopez Island, the flatest and least populated of the San Juans. Ride around the island to Iceberg Point and Spencer Spit State Park before heading to Lopez Village for lunch. After our ride, another short 15 minute Ferry gets us back to Orcas Island for our final night at Roasario Resort & Spa. Another short Ferry ride gets us to Friday Harbor on San Juan Island, our home for the next two days. Today you may choose an optional ride on your own or sightsee with us. The ride takes you to the north end of the island to Roche Harbor and then south to Lime kiln State Park, a great place to spot Orcas, before heading back to Friday Harbor. Or hop in the van with us and explore the island's sights! Stroll through over 100 unique sculptures in the 20 acre Sculpture Gardens. Have lunch at picturesque Roche Harbor Resort. Visit English and American Camp National Historical Parks, where British and American troops held a standoff in 1859. Look for Orcas swimming by at Lime Kiln State Park. Then stop by a working Alpca Farm before wine tasting at San Juan Islands Vineyard on our way back to town. If you want to go on a whale watching cruise, today is the day to do it. End the day exploring historical Friday Harbor, before having dinner in one of the many restaurant choices within walking distance. 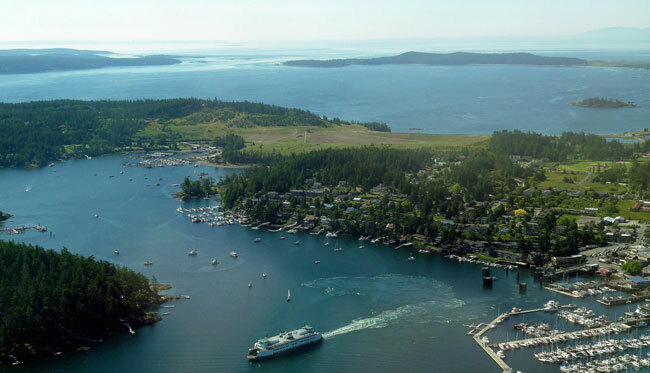 Today we circumnavigate all of San Juan Island from Roche Harbor and English Camp in the north, to Lime Kiln Park and American Camp in the south. Then crisscross quiet mountain roads through the middle of the island on small one lane forest roads. This is another long ride with over 4 hours in the saddle to complete our Tour of the San Juan Islands Scenic Byway. Saturday morning we depart San Juan Island on a Ferry back to Anacortes. We ride right from the Ferry onto Fidalgo Island and then south to Point Deception, where we cross over to Whidbey Island. Spend the rest of the day on waterside roads less traveled as we make our way down the island. Along the way we pass through the small towns of Oak Harbor, Greenbank and Langley. Much of our route follows the Tour de Whidbey, a popular local ride held in September. At the end of the ride we catch our last Ferry in Clinton back to the mainland, and then a 41 mile shuttle to the Seattle-Tacoma airport. If you don't have a late flight, plan to stay overnight and depart Sunday morning. Lunch on ride days is always included, unless the ride is optional. On this Tour 2 group dinners are included and riders are on their own for the remaining, with suggested seating times for those wishing to dine with others. A continental breakfast is always included of Greek yogurt, a selection of natural cereals, Bagels, cream cheese, etc. Hot breakfasts are on your own and require eating early in the Lodges. Copyright © 2004-2018 Cycling Escapes. All rights reserved.